We know that William Clayton founded Snickersville—now known as Bluemont—at the turn of the 19th century. But who was William Clayton? Where did he come from? How long had his family been in America? The following extract from a land release (removing a lien on the land) in the Chester County, Pennsylvania, Deed Book A-2, page 241, 1786, makes the connection for us. It shows that the fifth William Clayton in Chester County is indeed the same as the William Clayton who conceived Snickersville. To all People to whom these presents shall come William Clayton of Loudoun County in the State of Virginia Yeoman sends Greeting. Whereas William Clayton Father of said William Clayton being seized of a Brick Messuage and Seventy three Acres of Land in Upper Chichester Township in Chester County in Pennsylvania died Intestate leaving a Widow and Issue one son to wit the Said William and two daughters to Survive him and to whom the Same descended. And Whereas the Said Messuage and Land was valued and appraised by an Inquest awarded by the Orphans Court the twenty fourth of November 1772 and by Decree of the Same Court of the fifteenth of December in the year aforesaid the said Messuage and Land was adjudged to the said William Clayton. 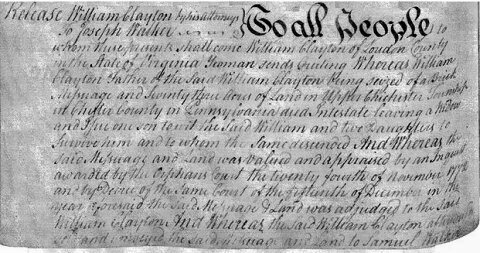 The fifth William Clayton (1740-1817) was “orphaned” (in the parlance of the law at that time) at the age of eight when his father--William Clayton of Upper Chichester Township in Chester County, Pennsylvania--died intestate (without writing a will). His mother administered the estate, lived on their land and raised the family. In 1772 when William was about 32, after his mother died, the Orphan’s Court completed the probate process and awarded 73 acres and a “Messuage” (or farm house with its adjacent buildings) to William and payments to his sisters for their shares. William then sold the land to Joseph Walker, holding a lien on the property which Walker was to pay off over time. Sometime between 1772 and 1786, probably about 1778, William Clayton moved to Loudoun County. When Walker completed the payments, Clayton released the lien in 1786. That is the release shown above. This story is important to the history of Bluemont. It links William Clayton of Snickers Gap to his father--William Clayton of Chester County—enabling us to track the Clayton family line far back into colonial days. The first William Clayton (1632 – 1689) immigrated to America in 1677, preceding William Penn. He served as a member of William Penn’s first Provincial Council, 1683 – 1684, and thus played a major role in establishing the laws and administration of the Colony of Pennsylvania. William Clayton the immigrant served as Council President for one term during which, in William Penn’s absence, he was virtual governor. The Claytons were members of the Society of Friends (Quakers) and played a significant role in the establishment of the Society of Friends in Pennsylvania. Quaker records along with land and probate records in Chester County document the line of descendants from the first William Clayton to the fifth who settled at Snickers Gap. During the Revolutionary War, William Clayton is reputed to have warned the British approaching Philadelphia in 1777 of a flanking threat by troops under General Anthony Wayne. The warning allowed the British to launch a surprise attack first in what became known as the Paoli Massacre. When the British left Philadelphia in 1778, Clayton was unwelcome in that area and thus fled to the wilderness of Loudoun County, Virginia. William Clayton became the founder of the village now known as Bluemont. He conceived Snickersville, laid out the village property boundaries in his will, built Clayton Hall with and for his son Amos, and acted as one of the first directors of the Snickersville Turnpike. -1740--William Clayton is born in Chester County, PA.
-1753--Orphan’s Court establishes the estate administration and guardianship. -1772--Orphan’s Court awards messuage and land to William and payments to his sisters (who are all living in Chester County, PA). -1773--William sells land to Samuel Walker, father of Joseph Walker, but holds a lien on the property. -1777--British win the Battle of Paoli and go on to capture Philadelphia. -1778--British abandon Philadelphia, William flees Pennsylvania and settles in Loudoun County. -1786--Walker pays off debt to Clayton, and Clayton releases his lien on the property. -1825--William Clayton's son Amos gives 1/4 acre of land to build a school and church in Snickersville (the Snickersville Academy). --Donald S. Coram is a descendant of William Clayton. He visited Bluemont in May 2015, to attend the 190th Anniversary celebration of the Snickesville Academy, Bluemont's first school and church. This informative article well demonstrates how the spark of interest kept alive by descendants of a historical personage can add to everyone's understanding of local history as well as the country's history. See Mr. Coram's article, "Northern Virginia Geograqphy and Genealogy" in theFairfax Genealogical Society Newsletter, March 2015 issue.